Report of " Divya Tour 2009 "
Report of "Divya Tour 2006" to USA, Canada of H. H. Sri Adhyatmanandaji Maharaj. 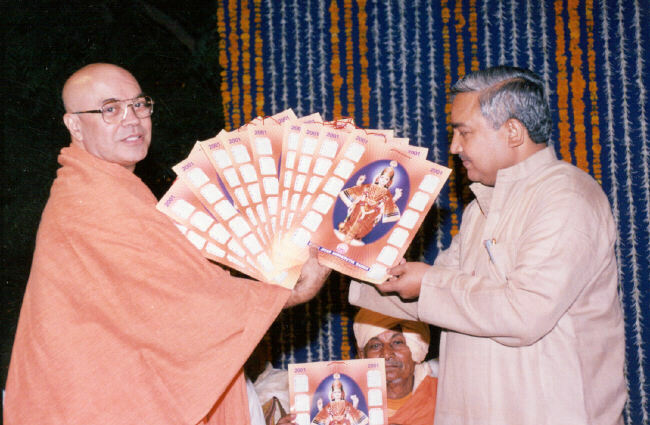 "Divya Jivan: - a Diamond Jubilee Souvenir of H. H. Swami Adhyatmanandaji. 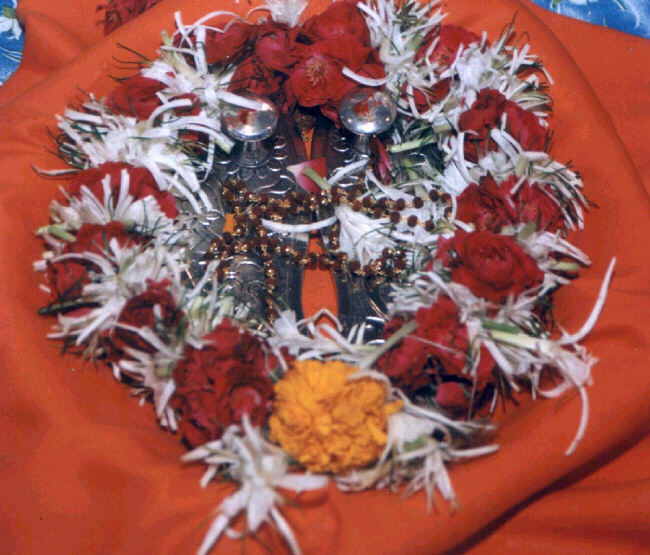 Spiritual Discourses by Mahamandleshwar 1008, Sri Swami Satyamitranandji's Maharaj( Jan 27, 2004 -Jan 31, 2004) follow up..
News and Activity report for the month of November- 2002. 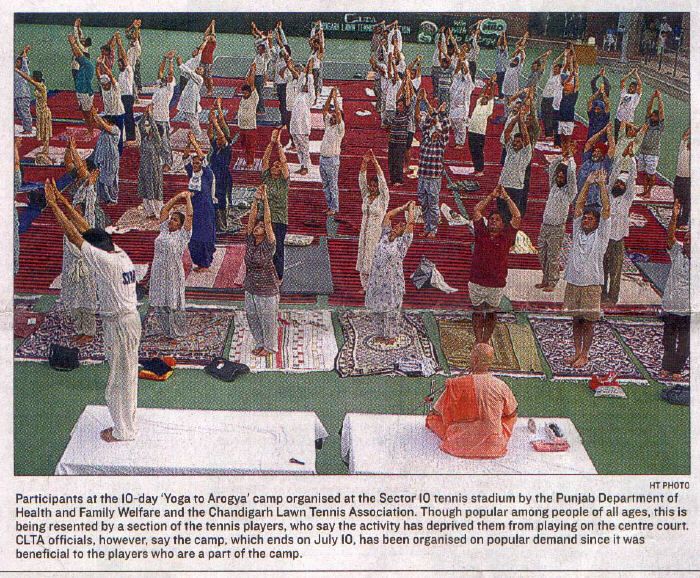 “Yoga to Arogya” a 10 day yoga camp was organized by Department of Health and Family Welfare, Punjab in collaboration with the Chandigarh Lawn and Tennis Association at sector 10 of CLTA stadium. Satsang were held on the occasion of Holy Guru-Purnima and 39th Mahasamdhi day of Holy Master Swami Sivanandji Maharaj that included padukapuja, bhajan -kirtan, an inspiring talk by Swami Adhyatmanandji on Sri Gurudev's life and the program concluded with distribution of mahaprasad. 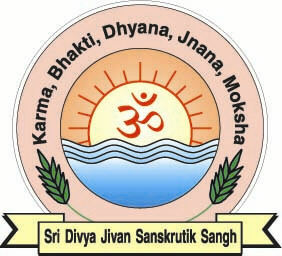 Divya Jivan Sangh Rajkot, Geeta Vidyalaya, Rajkot and Medical Association arranged the programs that included Yoga Shibir. Also lectures were organized at famous Rashtriya Shala. “Life “ organizations arranged a lecture in English. Akashvani Rajkot recorded a series of talks on various inspirational topics in Gujarati. 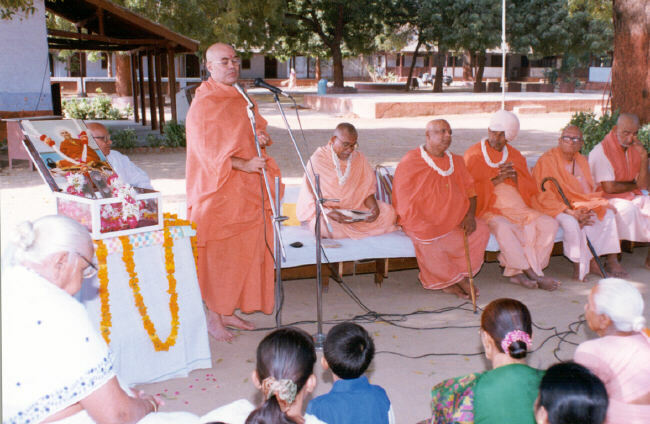 A spritual congregation (Adhyatmic Shibir) was organized by Vadodara branch of the Divine Life Society, on the bank of Narmada at sacred tirth sthan Kuber-bhandari Mahadev, Karnali from 5th to 7th Oct ‘2001 under the headship of Sri Swami Adhyatmanandaji Maharaj. 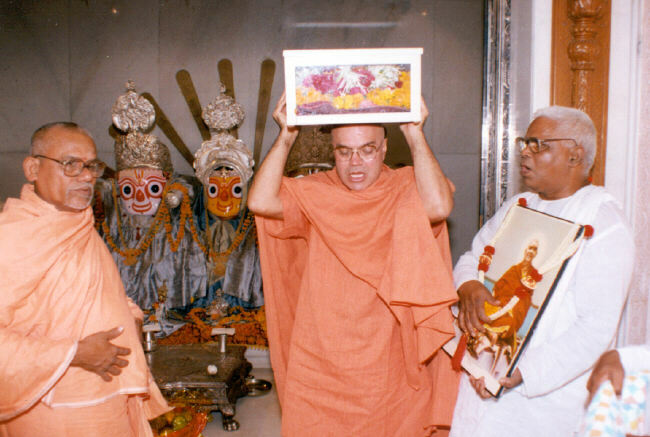 The shibir was arranged in the sacred punyasmriti of Sri Prasannakumar Mankodiji, a veteran devotee of The Divine Life Society’s activities in Gujarat. The shibir was conducted in a very devotional and cordial atmosphere and attended by 128 registered delegates – 67 from Vadodara, 38 from Ahmedabad, 5 from Dhragandhra, 4 from Rajkot, 1 from Shinor, 6 from Surendranagar, 7 from Khedbrahma & Kadiyadra. 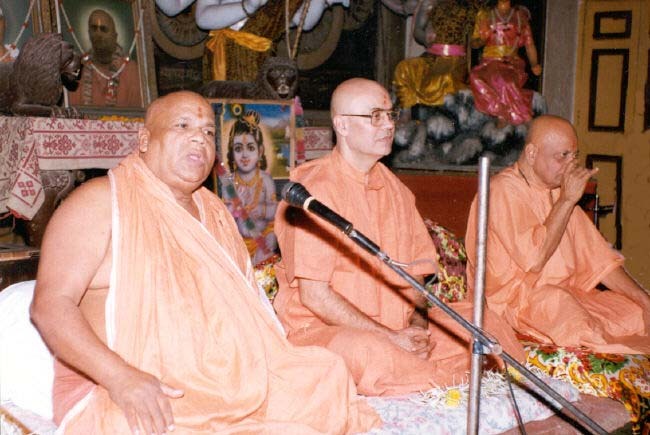 The shibir was adorned by sacred confluence of Sri Swami Gurukripanandaji Maharaj & Sri Swami Ashutoshanandaji Maharaj and Sri Swami Adhyatmanandaji Maharaj. The shibir was aimed at promoting intense spiritual sadhana (practices) and hence held in four sessions, early morning 5 to 6.30 am, morning session 9 am to 12 noon, evening session 3 to 6 pm and late evening session 8 to 9.30 pm. 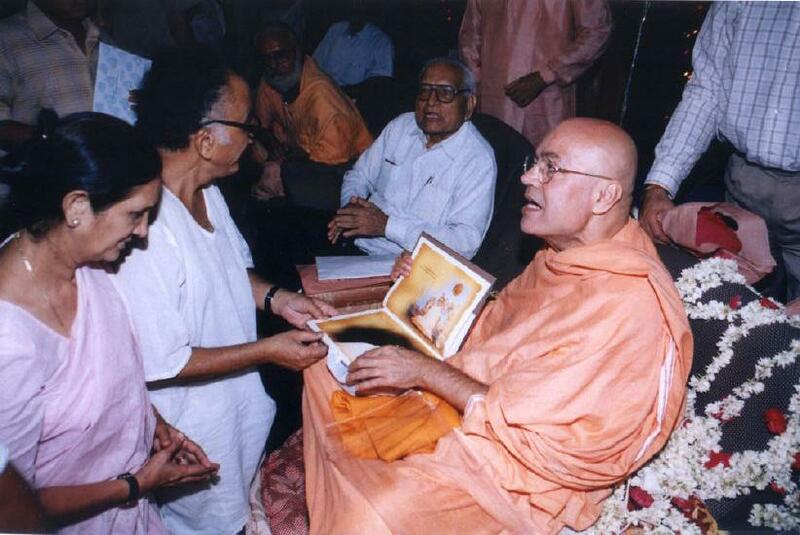 Sri Swami Adhyatmanandaji Maharaj led the different programs like recitation of entire Bhagawad Gita, Vishnusahasranam, different stotras like Narmadashtak, Purush Sukta, Sri Sukta, Narayan Sukta etc, inspiring talks aimed at intensifying spiritual sadhana in one’s personal, family, social & national life, meditation at the end of most sessions. 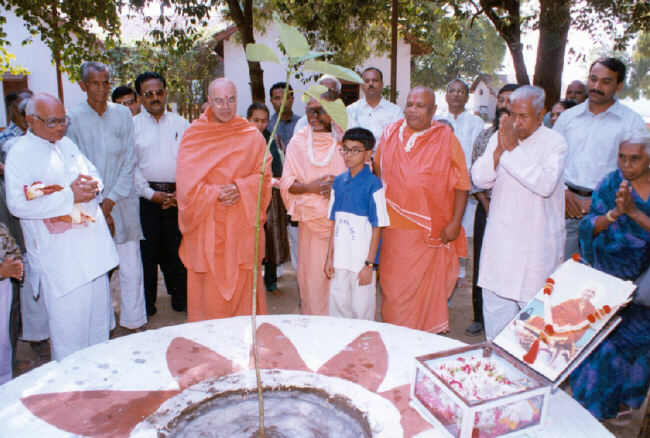 Besides Swamiji Maharaj, other sadhakas and invited guests also contributed their mite in the jnana yajna. 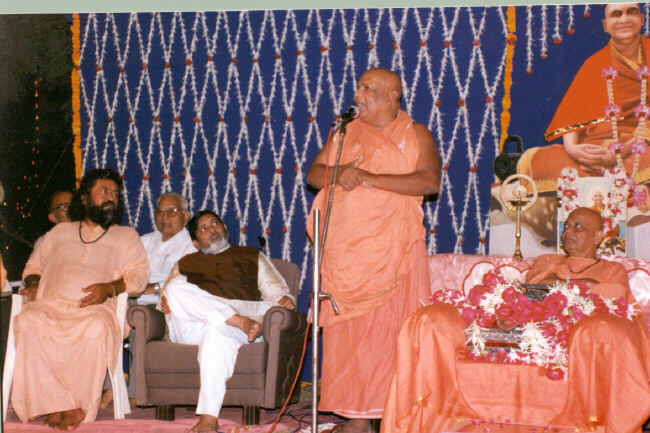 Sri Swami Ashutoshanandaji shared his thrilling & inspiring experiences of Narmada Parikrama. Sri Jayant Dave dwelt, the esoteric meaning of Divine Name (Divya Nam) as a vital link between manifest & unmanifest reality as propounded by Gurudev. Sri Vinayak Desai, a retired advocate hinted that we must ponder the admonitions of spiritual perceptions and shared his own experiences aimed at welfare & evolution of youth. Sri Prabhudas Patel, ex-president of Vadodara branch spoke on message of Lord Krishna to Uddhavaji described 11th chapter of Srimad Bhagavatam showing the modes of worship to Lord. Sri Mahipatbhai Rawal, a researcher on Bhagavad Gita spoke on religion describing it as a composite science dealing with material progress & spiritual evolution of mankind. He described Upasana, duties in daily life, rituals and philosophy as different dimensions of religion. Dr.Shailesh Mehta, an Ophthalmologist – described different types of meditation like Aarta, Raudra, Dharma and shukla (shuddha); first two describes adharma, third describes dharma (Kriya-bhav) and fourth leads to svarupa darshana. He aroused great interest among delegates, answered several questions and conducted two practicals like Pratikramana (negating the evils by divine thoughts) and bheddrashti(Atma –Anatma Viveka, distinction between the real and unreal). Shri B.Kajarekar of Vadodara, Sri Kanuprasad Pathak, Ms.Jesi of Ahmedabad, Smt. 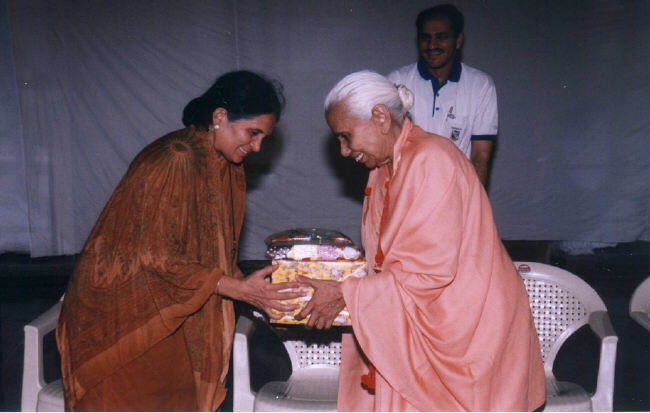 Yashodaben Amin of Ahmedabad presented devotional songs. At the end, the organizers thanked Sri Vinodbhai Shirolawala & Sri Rajnibhai Pandya, Trustee & Manager of kuber Bhandari Mandir respectively as well as Sri Chandrakant Purohit & Sri Bhikhubhai Bhagat, Trustees & Manager of Shivkripa for providing Hall, lodging rooms and allied facilities. Lastly Sri Jayant Dave presented a vote of thanks expressing gratitude to all the dignitaries referred to above and key workforce of the shibir – Sri Sadashivbhai Sheth, Sri Himatbhai Prajapati (Dahyakaka), Sri Ramanbhai Rana, Sri Sanatbhai Vyas, Sri Navinbhai Pandya and all others for their untiring & devoted efforts. Smt.Poonamben Thawani of Ahmedabad paid tributes to organizers for all their hospitality & loving care. All the delegates experienced a real thrill & joy when they sailed in Narmada river in three boats and visited Badrikashram, Gangnath temple & Sri Sri Ma Anandamayi Ashram while performing sankirtan and took a holy dip in the sacred river. 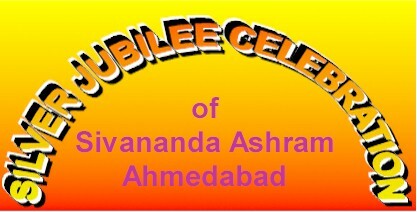 Celebration 86th Birthday of Sri Swami Chidanandaji Maharaj, at Sivananda Ashram, Ahmedabad (Gujarat) India. 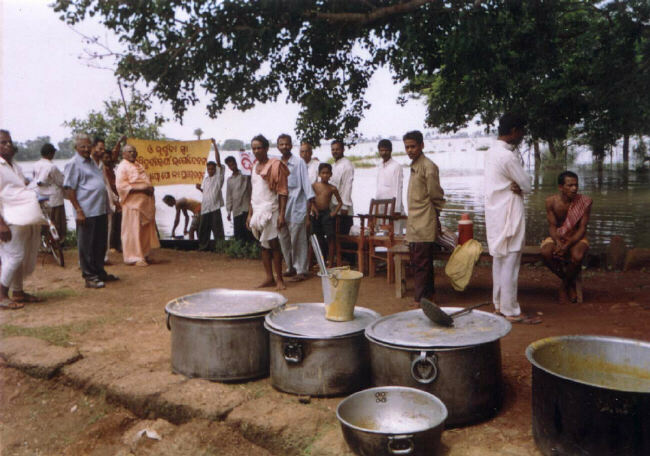 During recent flood of Orissa (east India) Sri Divya Jivan Sanskrutik Sangh Served food to one thousand people everyday, for sixteen days. Cooked food was distributed in twenty two villages. 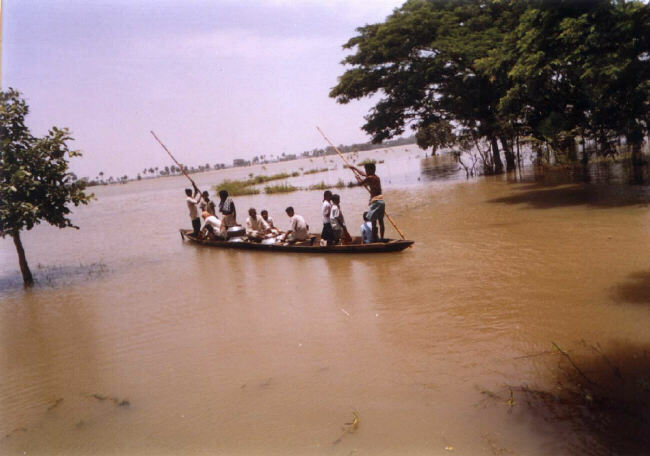 The food was transported by manual boat that took about fourteen hours to reach to the affected area to serve them. Rs.1000/- was given to each poor Harijan family to raise thatched house in Bharatpur village near Jajpur District of Orissa. This service was provided to twenty one families. 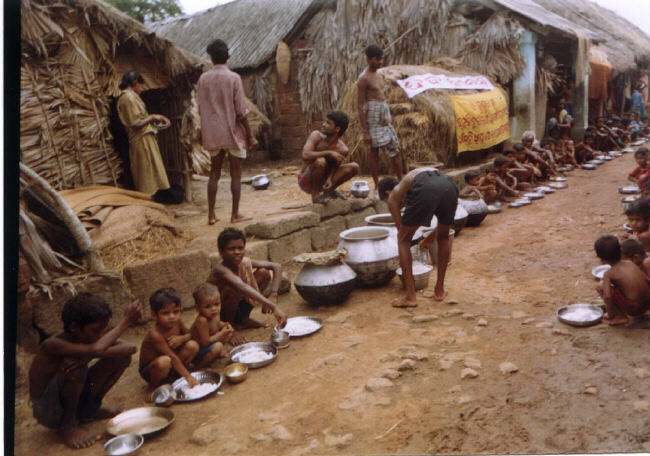 In pictures we can see the tribal manner of cooking, travel in hand boat and feeding to the distraught. 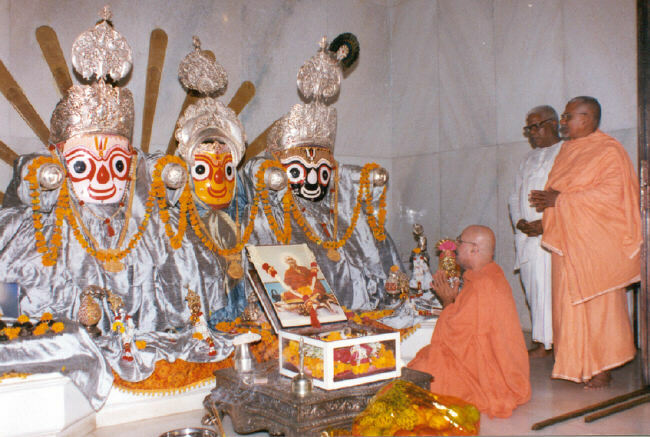 SRI GURU PURNIMA: The annual worship of Guru- Tattva or the principle of spiritual mastery in the hierarchy of the Guru-disciple relationship was observed at the Sivananda Ashram, Ahmedabad on 5th July 2001, as the holy Sri Gurupurnima, the full-moon day on which spiritual adepts and masters are adored everywhere. The day’s programme commenced from 5a.m. (Brahma-muhurta) with prayer and group meditation. 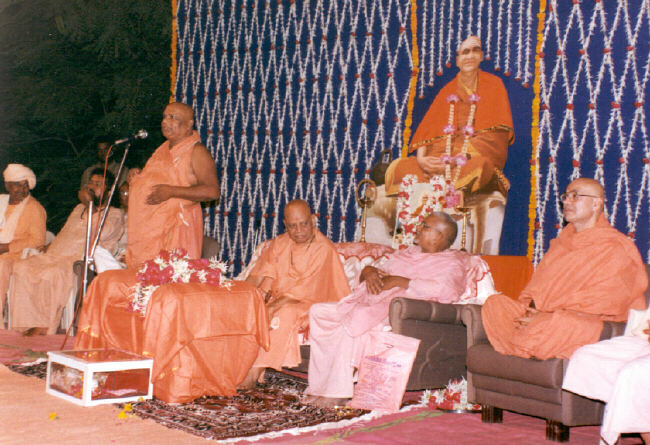 H.H Sri Swami Adhyatmanandaji spoke on the occasion, dilating upon the spiritual significance of the day. Also known as the Vyasa-Purnima, particular celebration is devoted to the invocation and worship of Bhagawan Sri Vyasa, who is regarded as the Guru of all Gurus. It is also held to be the special annual day of invoking God Himself as the Supreme Being, since all souls gravitate towards Him in greater or lesser intensity and the Guru is a gracious form, which God assumes in the expression of His relationship to creation in general. By self-control and the self-surrender, the seeking individual reasserts the presence of God in all things and unites itself with His presence in profound meditation. To the seeker, the Guru is not a person but a link in the chain of the procession of spiritual forces that ranges unremittingly from the absolute down to inanimate matter. It is only at the level of the human being that the consciousness of the operation of these forces arises and attracts the attention of the deepest aspiration in the man. In the forenoon an elaborate worship was conducted at the holy Sri Ashta Lakshmi Bhavan, with Abhishek and Archana. A large gathering of devotees came from different places participated in the worship. In the afternoon session, which was reserved for discourses, speakers dwelt on the life and teachings of H.H. 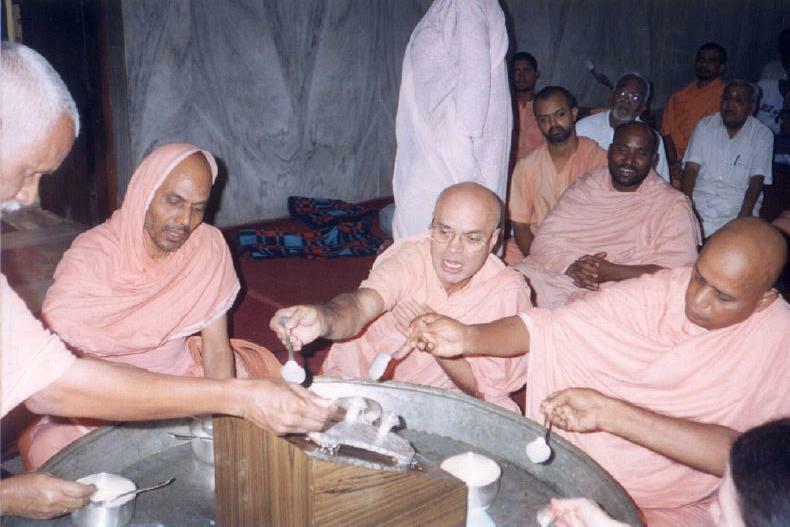 Sri Swami Sivanandaji Maharaj, as well Rev. Gurudev Sri Swami Chidanandaji Maharaj and the services of the Divine Life Society, which they founded as the medium for the propagation of the message of the great spiritual heritage of man. The austerities, meditations and services of the Saintly founder ensoul the institution even today and the Divine Life Society stands as an emblem of the strivings of those souls, a few in number though they be, who have girt up their loins to live the life spiritual in their own example, to proclaim the glory of God to the world and recognize God’s magnificence in the world or beings. H.H. 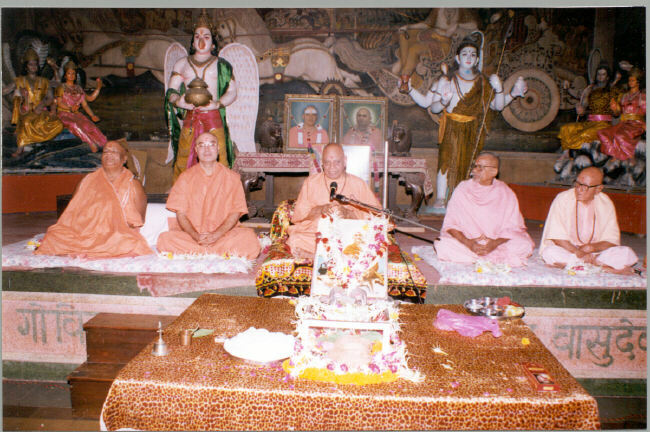 Sri Swami Shankeranandaji Maharaj, Sri Swami Ashutoshanandaji, Dr. Mafatlal Patani, Sri Balvantbhai Bhatt, Smt. Nayanaben Dave and Smt. Yashomatiben Trivedi shared their feeling and views about the glory of the Guru. The programme concluded with Bhandara (Feast). During night satsang, Prof. Mrs. Bansari Yogendra with the accompanist Mr. Bhargav Raval poured the nectar through their devotional singing. At Sri Ashta Lakshmi Bhavan along with Sri Adi Shakti Mataji Gurudev's photos and Padukaji. 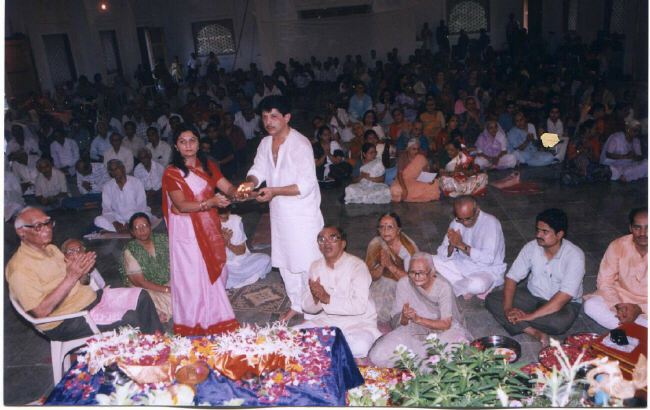 Amrut Mahotsav Celebration of Sri Gangananda Mataji on 7th July 2001 along with Smt. 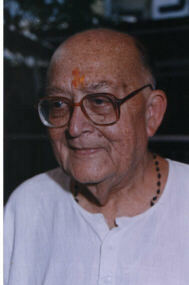 Umaben Antani -a founder of Bharatnatyam research group. SPIRITUAL RETREAT (SADHANA WEEK): The annual training of aspirants in Spiritual Sadhana, known as the Sadhana week, was held in the ashram for eight days from the 6th July to 13th July. The week’s programme consisted of illuminating discourses on the 13th chapter of Srimad Bhagavad Gita by Sri Swami Adhyatmanandaji Maharaj and Sri Rama- Valmiki’s Samvad from Ayodhya Kand of Sri Ramacharita Manas by Rev. Brahmacharini Shobha Chaitanya Mataji from the Chinmaya Mission- Paramdham, Ahmedabad. 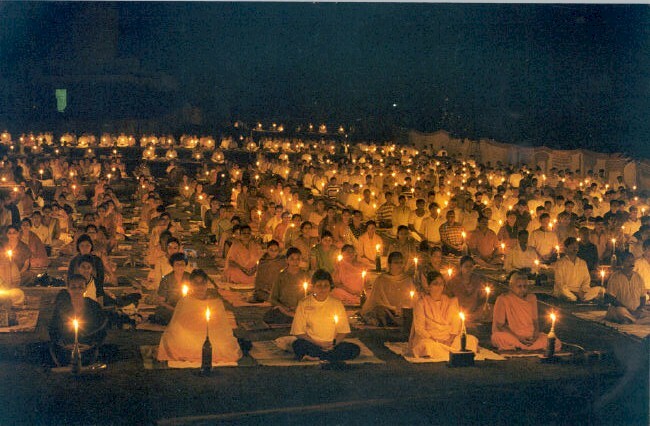 Entire programme was divided in four session with prayers, meditation, Gita and Sri Vishnu Shahashranam chanting and discourse, in which more emphasis was given on practical Sadhana, by inspiring sadhaka’s for three hours of meditation everyday and three hours of spiritual study, its reflection and contemplation. In the night Satsangs Smt Mayurikaben and Smt. Monikaben gave thrilling devotional Bhajan’s and Kirtans. At the same time Pro. Smt Uma Antani of Rasadhwani Institute of Bharatnatyam research, presented excellent dance performance by Dr Jay Thumar (M.D.) medicine accompanied by Miss Gargi, Payal and Shivangi. 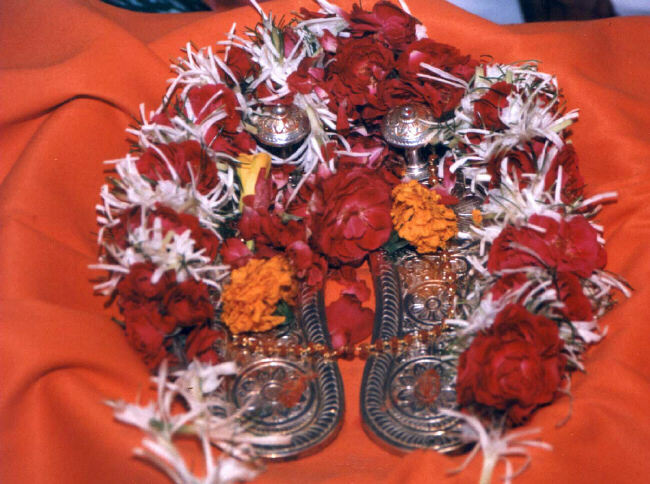 PUNYATITHI ARADHANA. The 38th Punyatithi- Aradhana Anniversary of His Holiness Gurudev Sri Swami Sivanandaji Maharaj was celebrated on 14th July. The function was almost replica of Sri Guru Purnima, with certain added items of worship, as well as variety programmes. 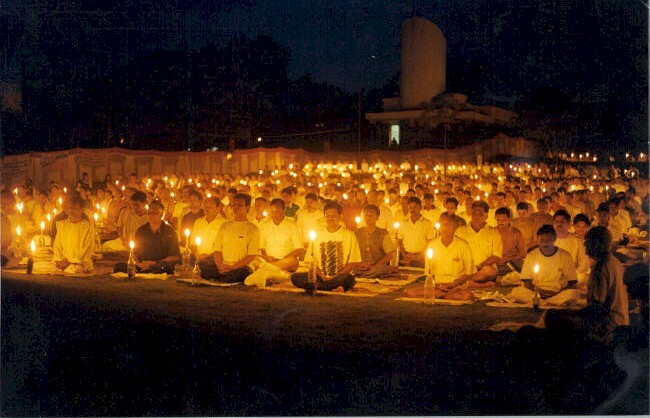 Prayers, meditation and recitation of peace chants formed early morning (Brahmamuhurta). Programme followed by Sri Vishwanath Mandir special pooja, Archana and Aarati. 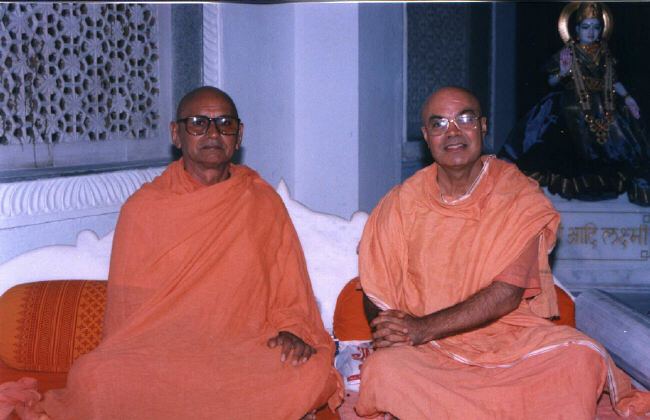 With utmost surprise; of all most Worshipful and Revered Sri Swami Swaroopanandaji Maharaj (107 years age) blessed disciple of Brahmalin Sri Swami Madhavtirthji Maharaj and chum of Rev. Gurudev Sri Swami Sivanandaji Maharaj graced the ashram. He arrived at very early dawn and participated in whole daylong function. During the forenoon session there were discourses on the life and teachings of Gurudev Sri Swami Sivanandaji Maharaj. Rev. Sri Swami Swaroopanandaji Maharaj shared his memory of Rishikesh of 1924 to 1936 (before setup DLS) with Rev. Gurudev and his two-generation of Sanyasa Diksha that is Rev. 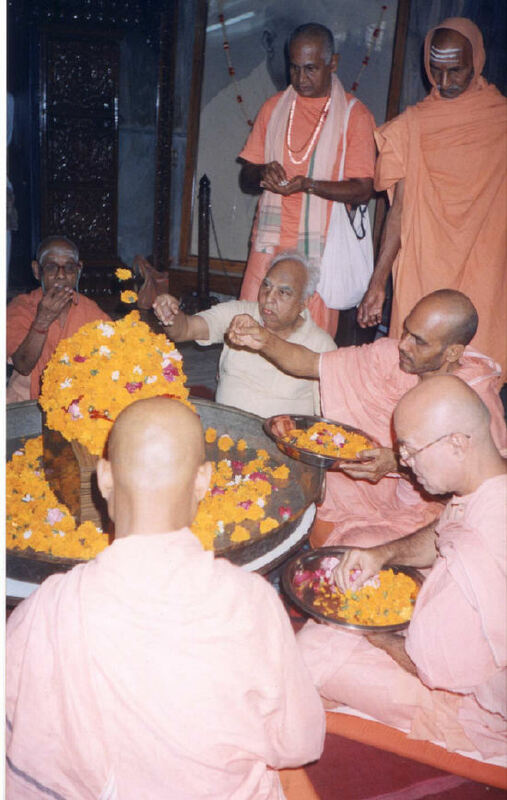 Sri Swami Vishnudevanandaji Maharaj, rev. Sri Swami Chetangiriji Maharaj of Sri Kailash Ashram, Rishikesh. 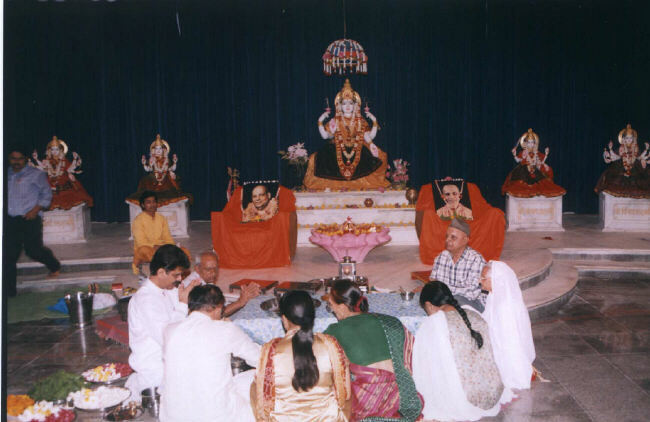 In the afternoon a grand Paduka Poojan was organized, devotees joined from all four corners of Gujarat, even devotees from Durban (DLS South Africa), from Switzerland, United Kingdom and other parts of India also joined the holy festival. Sri Bijoy Shivram, Smt. Polomi Pandit and Smt. Vanita Nagraj presented memorable dance performance and thrilled the august gathering. After peace prayer a Prasad (Dinner) Bhandara was given to one and all those who all joined the evening function. The celebration concluded with prayers for peace of the world. Late Sri P.C. Mankodiji learned about Sri Gurudev and read his literature sometime in the year 1950 during Sri Gurudev’s all India and Ceylon tour. 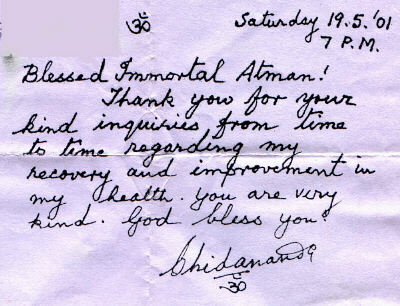 After visiting Sivananda Ashram for the first time in the year 1958, he became regular visitor and admirer of Sri Gurudev. He had initiation also in the year 1960. 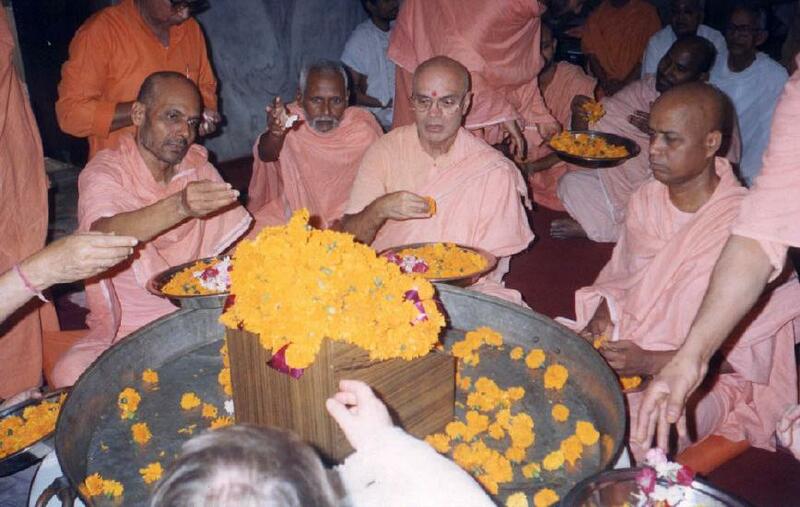 But after MahaSamadhi of Sri Gurudev in 1963, he practically lost interest to visit Rishikesh. But to his utmost surprise, the University of Roorkee, invited him for lectures now and then, and Rishikesh being next door, Sri Mankodiji’s visit to ashram continued without any hindrance and at the same time his attachment with the Divine Life Society became even stronger. Sri P.C. Mankodiji became a worthy president of the DLS branch Baroda and he organized a memorable rather unforgettable DLS conference at Baroda in the year 1968. 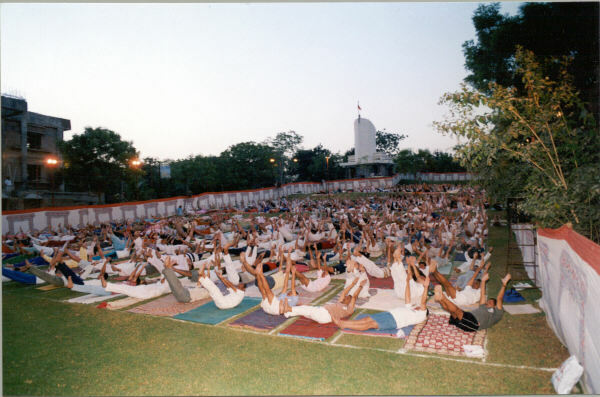 This was the largest programme with biggest gathering that Baroda or DLS had ever seen before. 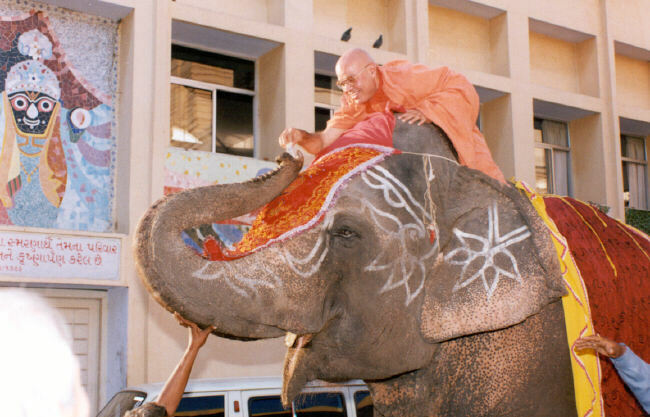 Sri Prasanna Kumar as name stood was ever cheerful, calm, quite, pious, witty and blissful. Initially he became a member of the board of management at DLS Headquarter, Rishikesh and later on some time in the year 1990 he was elected as a trustee of DLS H.Q. After Rev. 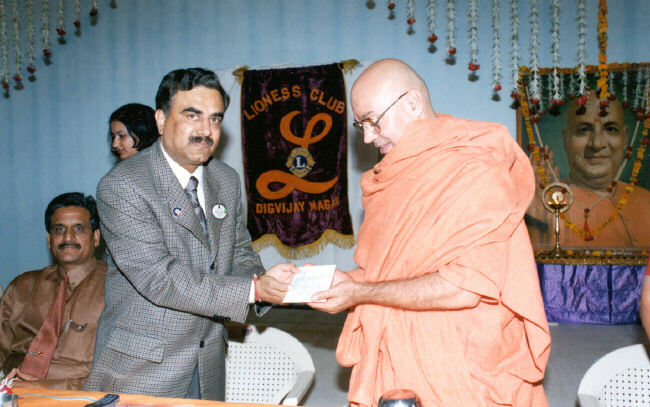 Bapujee Dr. Swami Yagnyavalkyanandaji’s passing away, he was elected as the chairman of DLS Gujarat unit. Born on December 23, 1923, he was an Electrical Engineer by profession and served the Gujarat Electric Board for Forty years and retired in the capacity of the Chief Engineer. He was very knowledgeable, service driven, proficient and ever sought after for his expertise in his profession. Sri P.C. Mankodiji was a very sincere sadhak. A spiritual seeker at the core, he was very regular and systematic in his daily routine. Having by heart Srimad Bhagavad Gita, he used to have his Gita meditation everyday from 4.00a.m to 6.30 a.m. without fail. Whenever he used to be at H.Q. DLS, he never missed morning satsang from 4.00 AM to 5.30 AM. He used to be with Late Sri Swami Vidyanandaji’s class. Sri Mankodi Sahab was very regular in his swadhyaya (self- studies) and loved to study and translate Sri Gurudev’s literature very regularly rather everyday. 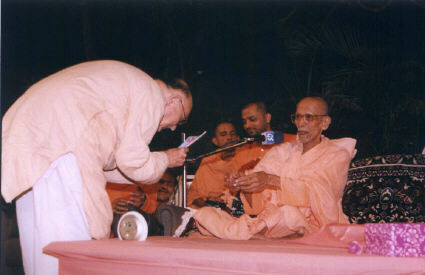 He last met Sri Swami Chidanandaji Maharaj at Ahmedabad on 28th and 29th April 2001. Rev. 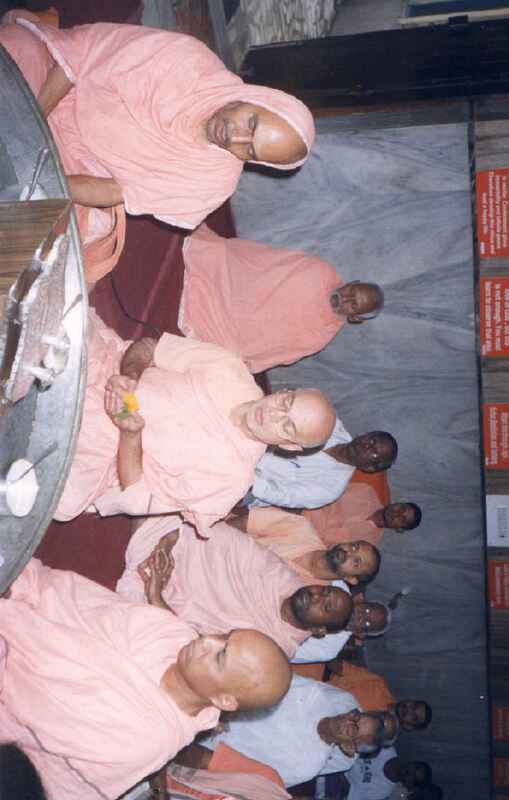 Sri Swamiji Maharaj had personal discussion with him regarding forth-coming trustee meeting at DLS H.Q. Rishikesh and specially requested him to attend it without fail. In spite of deteriorating and delicate health, he decided to go to Rishikesh against medical advice and obey Sri Gurudev’s request. He with his wife Smt. Pratibhaben came to railway station, boarded the train, but before train started Sri Mankodiji expired in the coach itself with massive cardiac arrest. His eyes and body both were donated as per his wish. Sweet memories of Him will be cherished for long time and his service to the Divine Life Society will be remembered for ever. He is survived by his one son Sri Kamalesh and two daughters Smt. Manjari and Smt. Raksha. 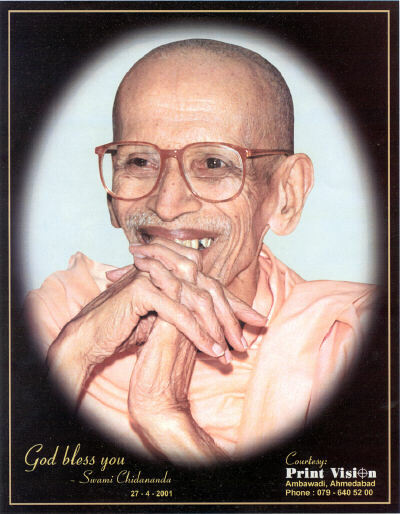 May Sri Mankodiji’s soul rest in everlasting peace and supreme blessedness. His passing away is a big irreparable loss to Sivananda Family at Gujarat in particular and H.Q. DLS Rishikesh in general. With passing away of Sri Mankodiji a race of Grandsire and Senior devotees of Sri Gurudev gets end. May there Sivananda Spirit be pathway to all seekers of truth and Bliss. As you probably remember, this camp was for patients of diabetes only. The Yoga Camp was a great success. This camp was a unique one, as it was organized in association with Dr. Mayur Patel, President of all India Diabetes Association. The camp was commenced on the International Diabetes Day to promote awareness about this very common and leading cause of mortality and morbidity not only in India but through out the world. The comprehensive and holistic approach to combat this dreaded disease was reinforced by proper patient education. This is a preventable disease and with proper care and discipline and even after it having been manifested, it can be controlled. Dr. Kirtibhai Patel, a leading Oncologist (cancer specialist), inaugurated the camp. Dr. Mayur Patel coordinated the latest advances in the treatment of the disease and importance of diet and medical care along with regular yoga exercises. 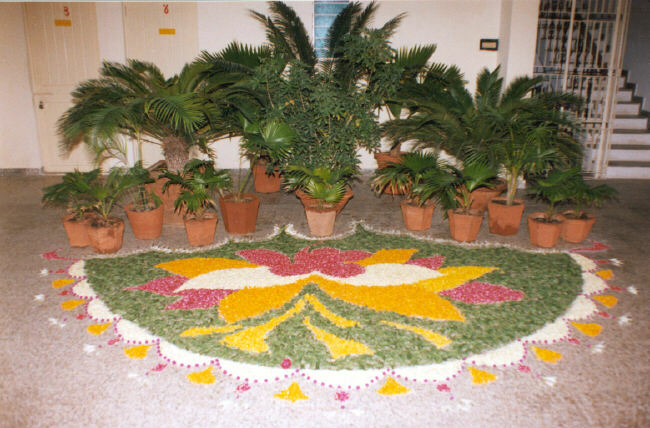 On 21st and 22nd Nov. 2000, a special Diet Exhibition of more than 1000 food items was organized in the Chidananda Dhyana Bhavan from 7.00 a.m. to 11.00 a.m. and 5.30 p.m. to 8.30 p.m. The event was covered in details by the Times of India, Gujarat Samachar, Doordarshan, Zee TV, Tara Gujarati Channel and Sandesh. We hope to bring the articles and clips to you as they are made available. Indian Medical Association state president Dr Kirit Patel lights a lamp to inaugurate a 10-day Yoga camp for diabetics at Sivananda Ashram in Ahmedabad, on the occasion of World Diabetes Day on Tuesday, as Swami Adhyatmananda looks on. Nearly 1,000 diabetes patients are attending the camp organised by Dr Mayur Patel and Dr Ina Patel who have been spreading awareness about the positive effect of Yoga in controlling blood sugar. This is a clip from Times of India. Diabetic Diet Exhibition at the Sivananda Ashram, Ahmedabad. 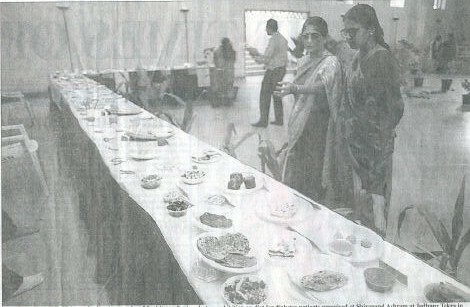 Visitors viewing the samples of food items displayed. This is a clip from Times of India. Founder President of the International Institution of the Divine Life Society, Sri Swami Sivanandaji Majaraj went on quick sixty days All India and Sri Lanka Tour in the year 1950 from 8th September to 8th November. He commenced his memorable journey from Rishikesh and went to Lucknow, Varanashi, Patna, Calcutta, Bhuvaneshwar, Andhra Pradesh, Tamil Nadu, Colombo (Sri Lanka), Kerala, Karnataka, Maharashtra, Gujarat, Rajasthan and via Delhi went back to Rishikesh. During this historical tour, he was received enthusiastically by huge assembly everywhere. His message was broadcasted by practically all the stations of All India Radio. He was warmly welcomed by leading and prominent citizens, leaders and Maharajas including Nizam of Hyderabad. 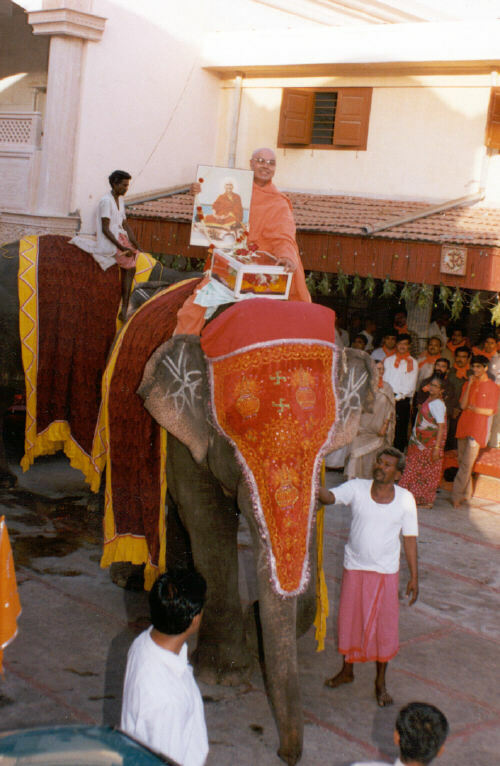 During his visit to Ahmedabad, Sri Swami Sivanandaji Maharaj was accorded a grand public reception on the 1st November 1950 at the Premabhai Hall, where he was warmly received by an enormous gathering of elite and common people. The reception committee was formed of prominent and notable dignitaries such as Shri N.B. 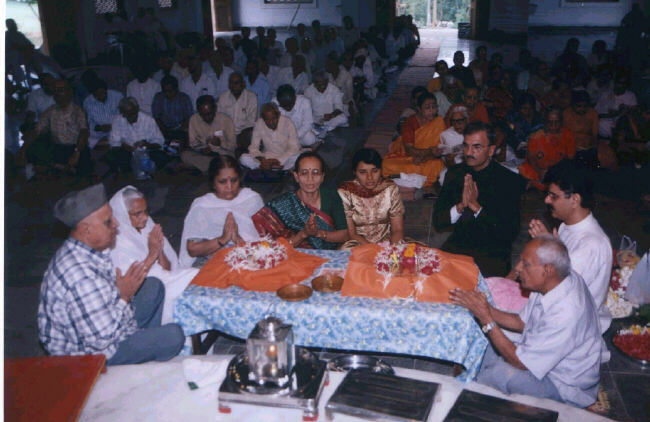 Thakor, Swami Sivananda of Gita Mandir, Mr. Nandalal C. Bodiwala - Principal Editor of daily “Sandesh” at that time, Sri Shantialal Mehta, Swami Madhavtirtha, Shri Chimanlal Thakor and Mrs. Kevalram P. Chalaramani under the Chairmanship of Shri Haridas Acharatlal. 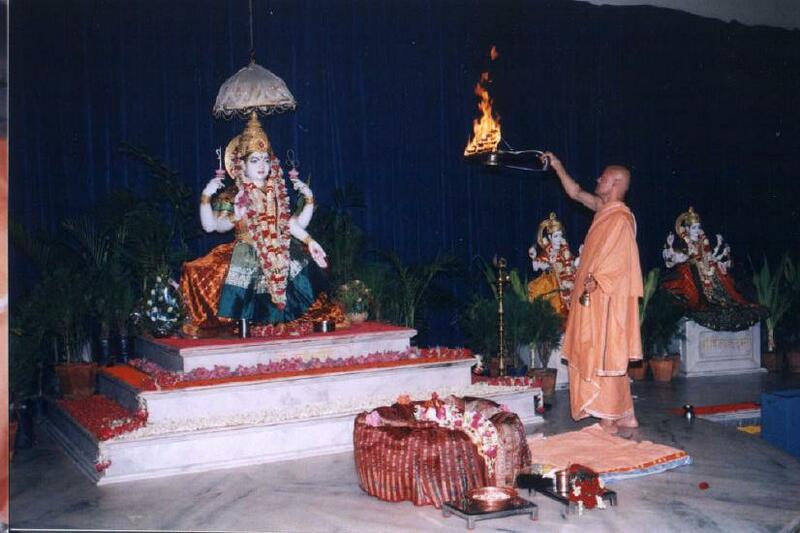 Late Sri Swami Vidyananandaji Maharaj of the Gita Mandir organized two more largely attended satsang gatherings in the Gita Mandir to honor Swamiji. Holy Master Sri Swami Sivanandaji Maharaj visited the Sabarmati Ashram of Mahatma Gandhi where Sri Pratapbhai, chief organizer of the Ashram, welcomed him. 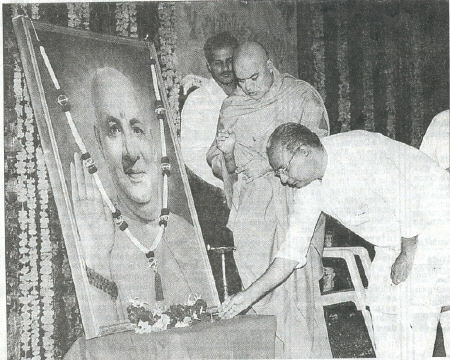 Swamiji immediately recognized him and then commented, “ We met each other on the bank of Ganga first and now you have drawn me on the bank of Sabarmati.” When Swami Sivananda was approaching podium to speak, someone requested him to speak in Hindi.” Swami Sivananda humorously responded, “Oh.. Ji! I know only three words in Gujarati, Khem Cho?...Gahnoo Saroo Che... Theek Che.. and only a little bit of broken Hindi.” Needless to say, the entire audience burst forth into Laughter. 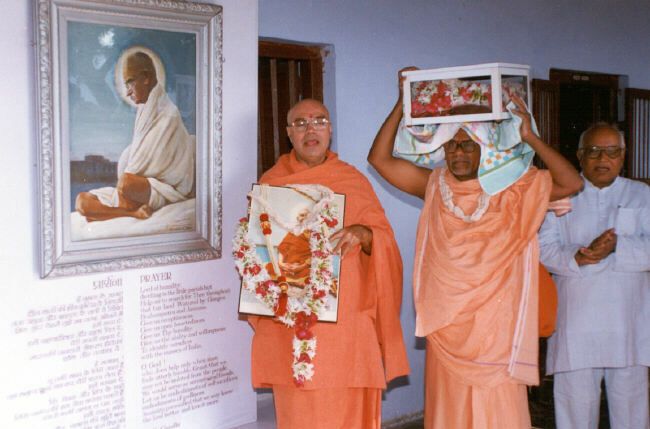 Replicating the tour of Holy Master Sri Swami Sivanandaji Maharaj, now his devotees and monks headed by Sri Swami Gurusevanandaji commenced their All India Tour with the Holy Padukas (Sandal) of Swami Sivanandaji Maharaj, started from Rishikesh on 8th September,. 2000 and just following the same time schedule and places as their Revered Holy Master did, after visiting U.P., Bihar, Bengal, Orissa, etc. entered in Gujarat. 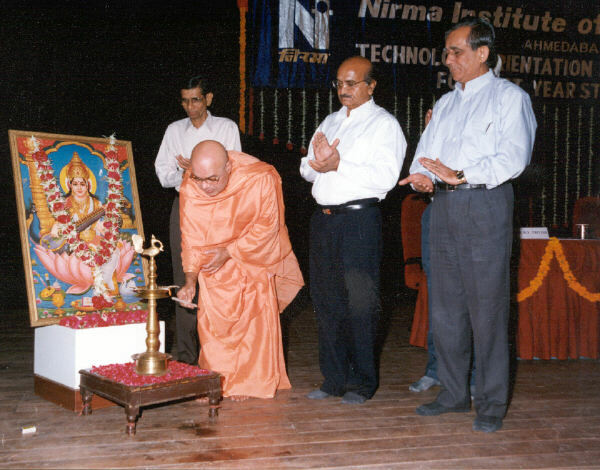 The team visited Valsad, Amalsad, Kachholi, Surat, Bharuch, Baroda and arrived Ahmedabad on November 1, 2000. 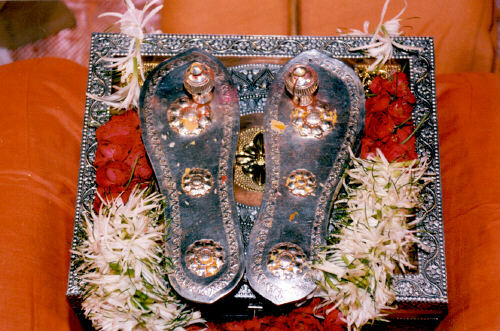 Just as their Master fifty years ago, His Paduka along with the team were received again at the Gita Mandir by the present Chief of the Temple and head of Akhil Bharat Sadhu Samaj, M.M. 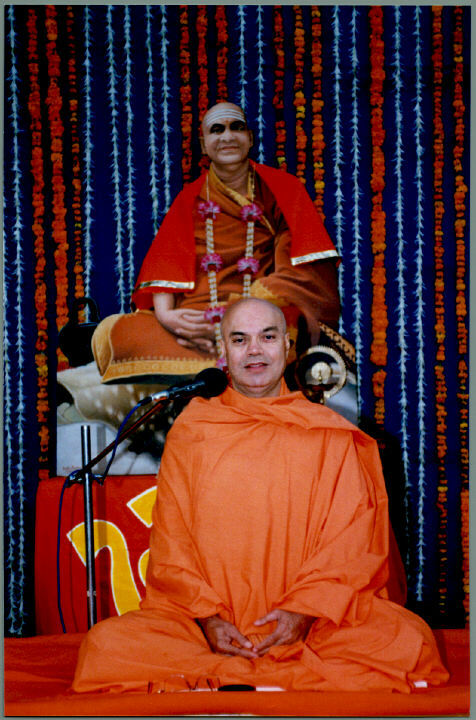 Sri Swami Mangalanandaji Maharaj. 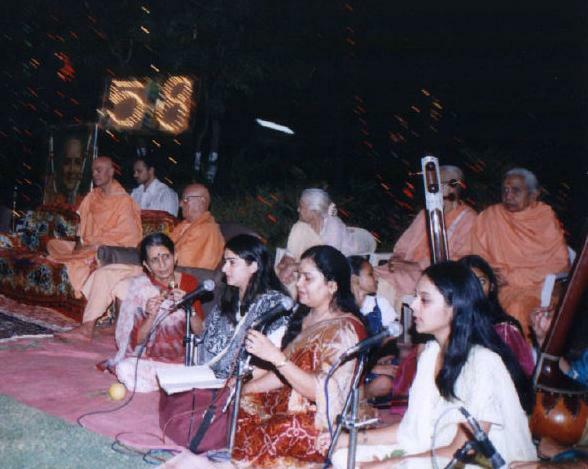 Mrs. Haribala R. Dave, now septuagenarian, sang the same devotional hymns that she sang for the Holy Master Sri Swami Sivanandaji Maharaj fifty years ago, this time for the touring party along with the Master's paduka, once again in the program attended by a huge audience at the Sivananda Ashram. 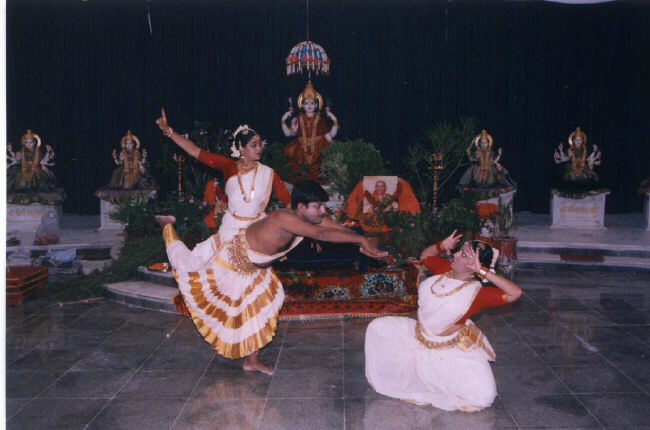 In the evening, the party was received with soothing sound of the temple orchestra from famous Sri Hatkesh Temple of Jamnagar, a thrilling performance of the world famous Ras-Mandali of Maldhari Yuvak Mandal Shakti Para Surendranagar, a prayer dance, "Dev Dev Sivananda Dinbandhu Pahimam..." in Bharat-Natyam style by a group of disciples of Ms. Dolly Desai and a warm welcome address was rendered on behalf of the citizens of Ahmedabad and the Government of Gujarat by Mr. Bharat Barot, the Minister of Higher Education. This is the highest Sadhana. Swamiji further elaborated, “Even one harsh word upsets you and brings about bloodshot eyes and you at once react to it. You are not able to control yourself in spite of your education and training. You should learn to bear insult and injury with equanimity. This demands the perfect pulverization of the ego. Every word is nothing but sound vibrations in the ether. You should inquire, "Who am I? Who is abused? By whom?" Thus utilize every occasion when you are insulted as a very good opportunity for introspection, enquiry and spiritual progress. Remember, nothing exists, nothing belongs to you, you are neither mind nor body. Immortal self you are...” The program was concluded with candle light meditation and prayers for the peace of the world. 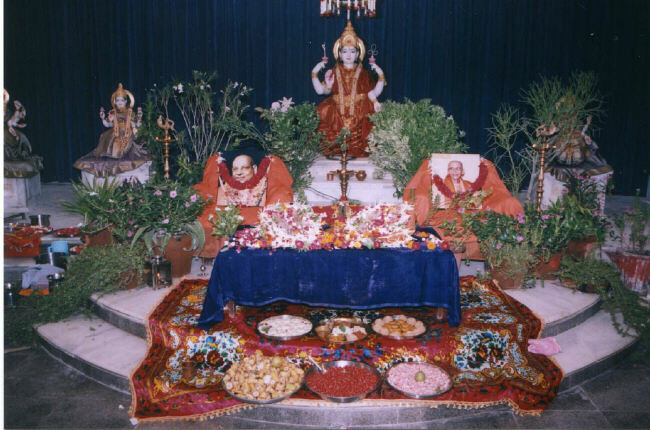 The Sivananda Ashram, Ahmedabad was established on November 1, 1975 and had its Bhumipooja done by the present head of The Divine Life Society, H.H. 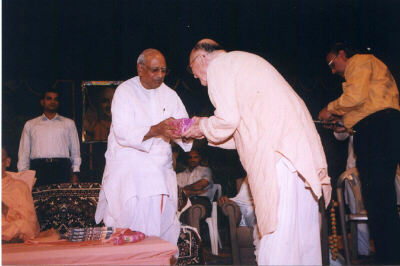 Sri Swami Chidanandaji Maharaj in the worthy presence of the Mr. K.K. Vishvanathan, then the governor of Gujarat. The ashram is now providing valuable services to the community under the able leadership of Sri Swami Adhyatmanandaji Maharaj. 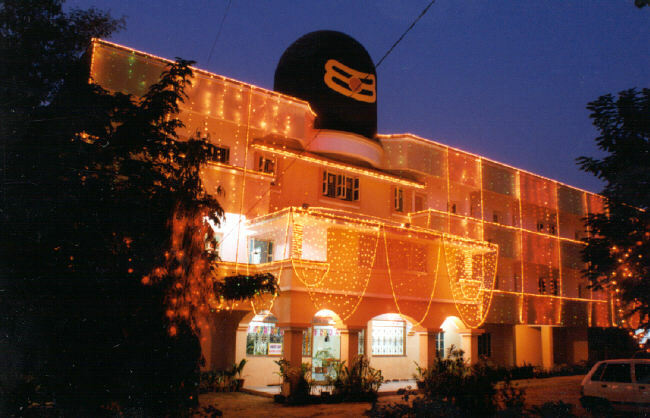 The ashram is celebrating its Silver Jubilee with program such as 569th Yogasan and Meditation Camp (from 5.00 a.m. to 7.00 a.m.) for general public and discourses on Sunderkanda (from 6.30 to 8.00p.m.) by him in the evening up to Nov. 8th 2000. 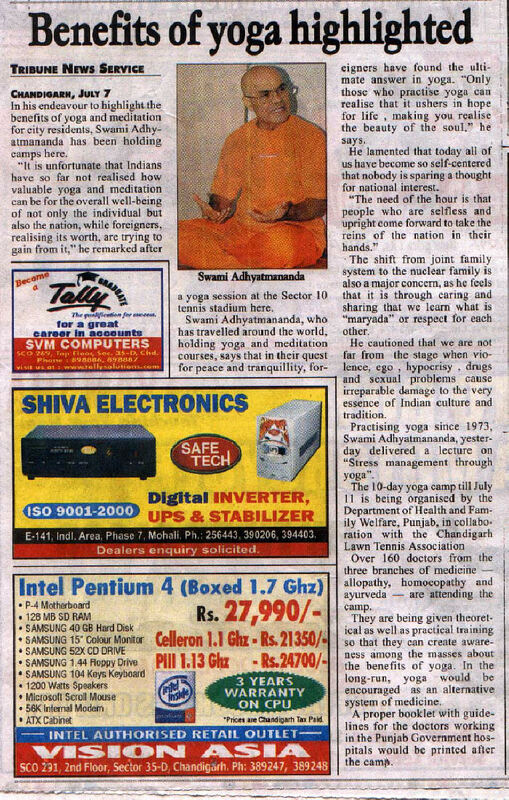 As an extension to this festivity, Sri Swami Adhyatmanandaji Maharaj, a well known Yoga Exponent is organizing 570th Yoga Pranayama and Meditation Camp (Nov. 14th to Nov 23rd 2000) only for diabetic patients in association with the leading diabetes specialist, Dr. Mayur Patel to commemorate The International Diabetes Day.